Publius Aelius Hadrianus (January 24, 76 - July 10, 138 AD). Adoptive father of Aelius and Antoninus Pius. Publius Aelius Hadrianus lost his father early in life and was entrusted to the guardianship of the childless Trajan, who was a distant relation of his. After serving in several positions, primarily in the military and accompanying Trajan on many of his campaigns, and after the death of the later in August 117 at Antioch the army hailed him as Augustus, presumably after his hasty adoption and nomination by the dying Trajan himself. The Senate complied. 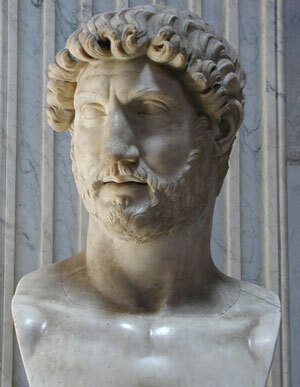 The choice proved a good one, for Hadrian went on to rule as one of the most successful Roman emperors. He discontinued the aggressive foreign policy of his predecessor in the East, stabilized the Danubian frontier by confirming the annexation of Dacia, financed the building of the famous Hadrian�s Wall in Britain to defend the island against northern depredations, and spent an enormous amount of his time traveling around the Empire to learn about and help solve the various problems encountered in the provinces. His concentration on stationary frontier defense allowed the growth of urbanism behind the now more or less stable Roman limes. The legions received his constant attention no less than the civilians of the empire, even though fighting was sporadic during his reign and one of the major operations was the crushing of Bar Kochba�s Second Jewish rebellion in 132. He was also very interested in jurisprudence and under his Roman Law entered its Golden Age. He was also a keen adherent of the religious mysteries and quite educated in the classics, including the arts. He is even credited by some to have instigated a whole new manner of artistic representation that began developing in the second decade of the second century. His aesthetic ambitions and his perception of style are perhaps best expressed in the monumental architecture he sponsored, his villa in the Roman countryside and his impressive pantheon in the Field of Mars in Rome, which was the first monumental temple to allow the worshippers indoors. Mints: Rome, Asian (uncertain location), Bythinian (uncertain location). List all Hadrian coins in the Catalog.